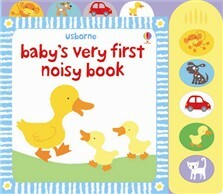 Delightful board book with a sound panel and high contrast illustrations specially designed to appeal to the very young. With each picture, there is an onomatopoeic word, such as "woof" and "quack", and babies can press the buttons on the sound panel to make the appropriate noises. There are plenty of surprises in store with this fun little book that promises to tantalise your baby’s ears with animal sounds (and a beeping car, for good measure). The chunky boardbook format has cute illustrations, and index tabs so it’s easier for your baby to turn the pages, while the push-button feature helps to teach cause and effect. Expect to hear many repeat renditions of the noises once your baby masters the skills of activation. A lovely new book for babies containing beautifully designed high-contrast images that are easy for babies to focus on while interacting with the fantastic sounds. Usborne excel at this sort of thing and its sound chips in particular are a cut above the rest of the market.